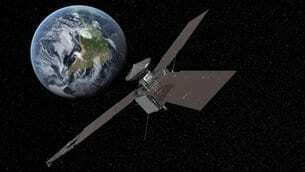 A mystery that has stumped scientists for decades might be one step closer to solution after ESA tracking stations carefully record signals from NASA’s Juno spacecraft as it swings by Earth today. NASA’s deep-space probe will zip past to within 561 km at 19:21 GMT as it picks up a gravitational speed boost to help it reach Jupiter in 2016. During the high-speed event, radio signals from the 2870 kg Juno will be carefully recorded by ESA tracking stations in Argentina and Australia. Engineers hope that the new measurements will unravel the decades-old ‘flyby anomaly’ – an unexplained variation in spacecraft speeds detected during some swingbys. “We detected the flyby anomaly during Rosetta’s first Earth visit in March 2005,” says Trevor Morley, flight dynamics expert at ESA’s ESOC operations centre in Darmstadt, Germany. Since 1990, mission controllers at ESA and NASA have noticed that their spacecraft sometimes experience a strange variation in the amount of orbital energy they pick up from Earth during flybys, a technique routinely used to fling satellites deep into our Solar System. The unexplained variation is noticed as a tiny difference in the expected speed gained (or lost) during the passage. The variations are extremely small: NASA’s Jupiter probe ended up just 3.9 mm/s faster than expected when it swung past Earth in December 1990. The largest variation– a boost of 13.0 mm/s – was seen with NASA’s NEAR asteroid craft in January 1998. Conversely, the differences during swingbys of NASA’s Cassini in 1999 and Messenger in 2005 were so small that they could not be confirmed. April 1, 2019 - NASA news: 'CRITICAL' discovery of massive star birth sheds light on deep space mysteries Express.co.ukNASA'S incredible discovery of never-seen-before young stars has given astronomers insight into how massive stars form in the depths of space. April 19, 2019 - Dark Phoenix Theory: Jessica Chastain's Mystery Character Is [SPOILER] CBRThe identity of Jessica Chastain's character in X-Men: Dark Phoenix may be the Phoenix force itself. April 4, 2019 - Solving a century-long mystery: the origin of galactic cosmic rays SciTech Europa"It seems we are at the threshold of obtaining a solution to the century-old enigma of the origin of galactic cosmic rays." March 22, 2019 - A Single Thundercloud Carries 1 Billion Volts of Electricity Live ScienceResearchers used muons to map the energy inside a thundercloud — and it's unfathomably massive. April 1, 2019 - New books Physics TodayA listing of newly published books spanning several genres of the physical sciences.